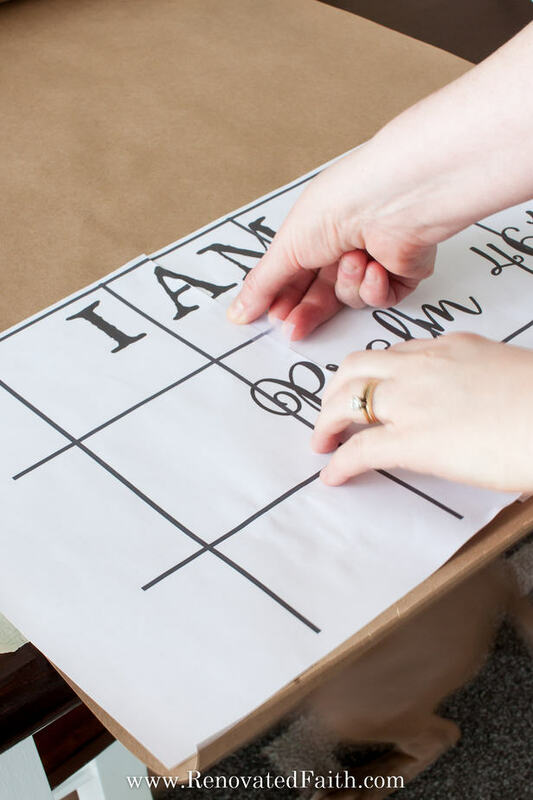 If you love the look of DIY scroll wall art but don’t have fancy handwriting or a Cricut, check out this tutorial on how to make a scroll sign the easy way! Scroll wall decor has been popping up quite a bit lately but often times the wording is hand written. I don’t know about you but, I couldn’t freehand a verse or quote if my life depended on it! Fortunately, there is an easy work-around for this issue and I use this fool-proof transfer method on every sign I make now. I spent a whopping $5 on my scroll sign and love the way it turned out! 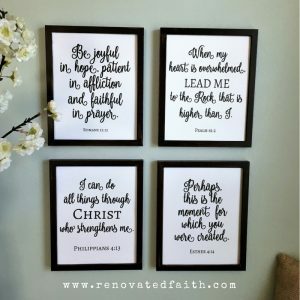 Enjoy decor that encourages you in your faith daily! You probably already own several of the items on this list. I only had to buy the kraft paper for this project, so I only paid $4.97 on the entire project. If only every project was this inexpensive! Rotary Cutter – I love this one for making long cuts but you can also use scissors! 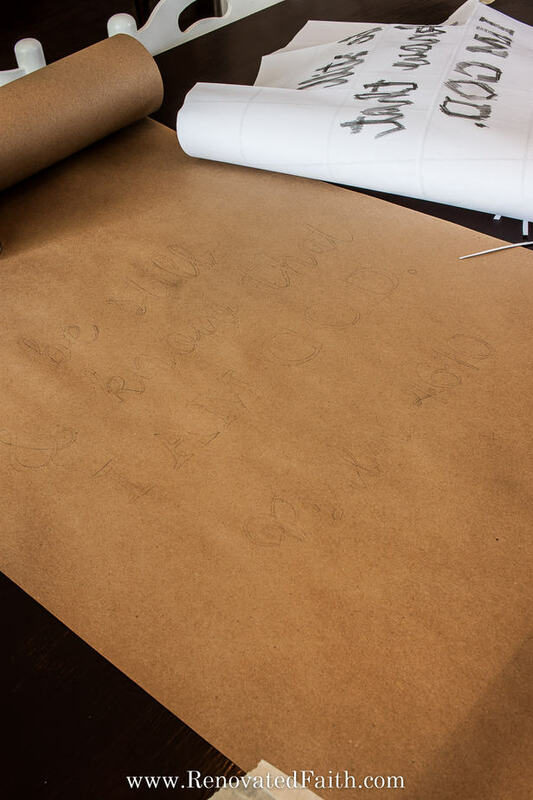 The kraft paper I bought was 30″ wide but you can make your paper scroll decor any width you want to match your space. For example, I wanted mine to be about 21″ wide to go over my blue vintage window that was already hanging. 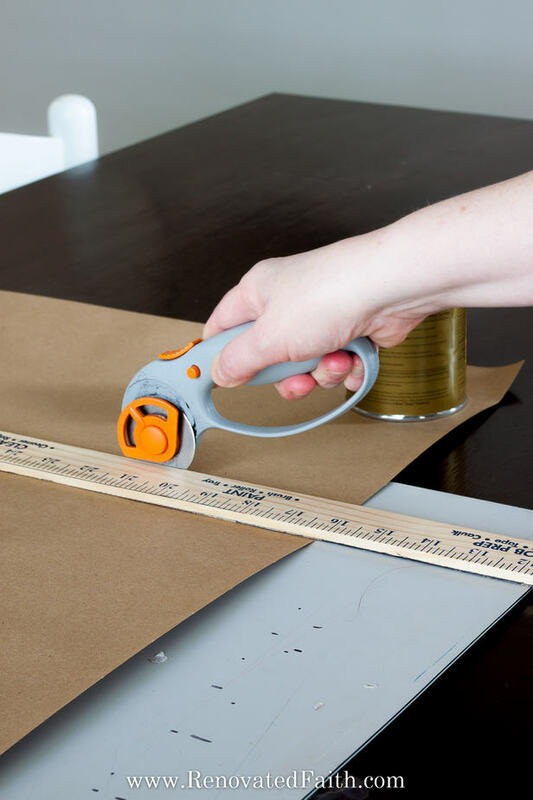 Trace a straight line and then use your rotary cutter up against the ruler or a straight edge as you cut. Be sure to leave about 8-12 extra inches on the top and bottom to have extra paper to work with when you curl up the ends. You have two options for making your template. 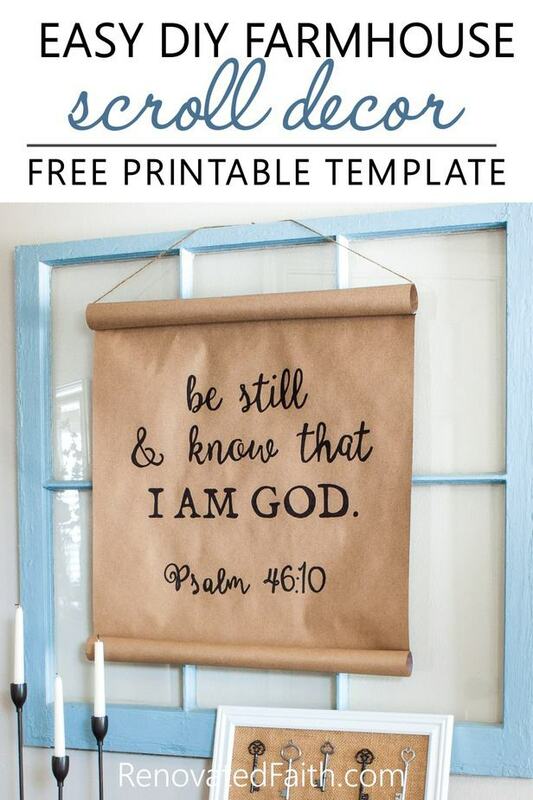 You can use my free download of the Be Still and Know Template by subscribing here: Be Still and Know (Psalm 46:10) Scroll Template See the print instructions further down. OR you can make your own using the instructions below! Make your template using a free program called Photoscape which you can download here: Photoscape X. Just click on the Windows or Mac option. Then, it takes you to a screen where you have the option for the Free Trial, which is all you need. (The Photoscape Free Trial lasts forever). 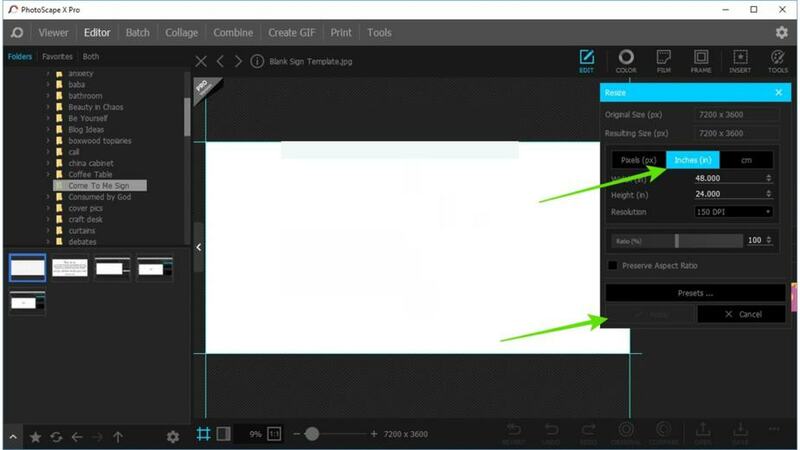 Download the blank template on your computer and upload it into Photoscape by clicking “Editor” at the top left and by opening the file on the left-hand side. Click Edit at the top right and Resize just under it. We are doing this to set the template to the actual size of our paper scroll (the uncurled portion). 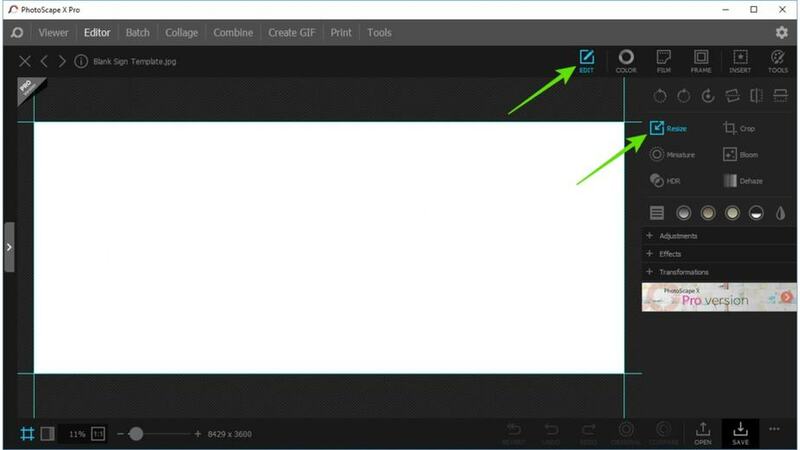 Now start working on your layout by selecting “Insert” at the top right and then “Text” to the right of that. Insert your wording. Click “Apply” when done and click Save at the bottom right. 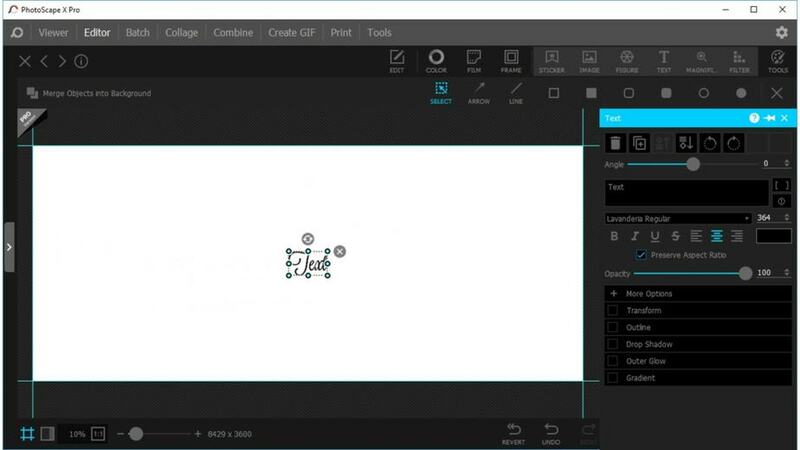 If you don’t like the fonts on your computer, you can some great ones at this site: Free Hand Lettered Fonts Just be sure to close out Photoscape and reopen it so the fonts will appear in the font option window. After you design your template file, save it as a jpg. Convert your jpg file to a pdf for free by going to zamzar.com. (The file has to be a pdf file to open it in Adobe Reader, which allows you to print the poster format). Just upload your file and select that you want a pdf and it will email you the new file. Easy Peasy! Go to Adobe Acrobat Reader (I promise this is the last program) and open the pdf version of your scroll sign there. (Download Acrobat HERE if you don’t already have it.) Click on the print menu and click on Poster under Page Sizing and Handling and it will set up your sign to print separate pages. Now, you can print! Open the file in Adobe Acrobat Reader. (Download Acrobat HERE if you don’t already have it.) Click on the print menu and click on “Poster” under Page Sizing and Handling and it will set up your sign to print separate pages. Now, you can print! 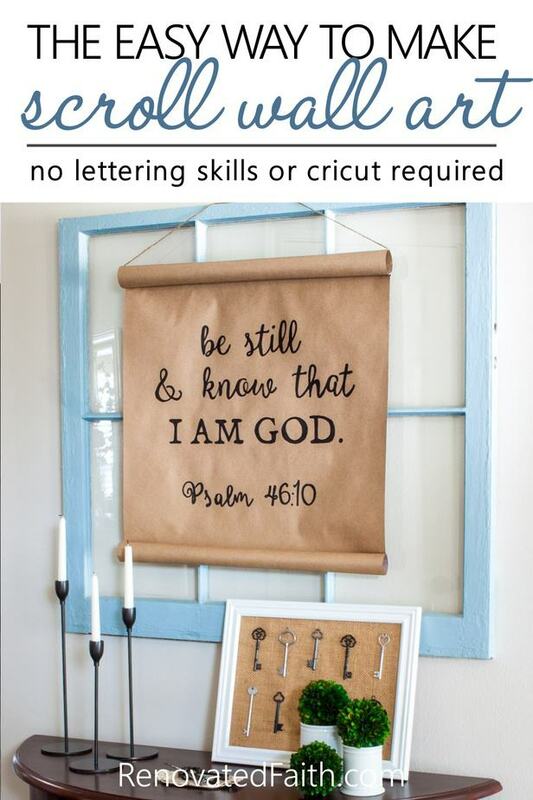 Cut your sign to 21″ x 21″(uncurled portion) for this template. When you’re done, flip the paper right side up and line it up as straight as possible on top of your sign. 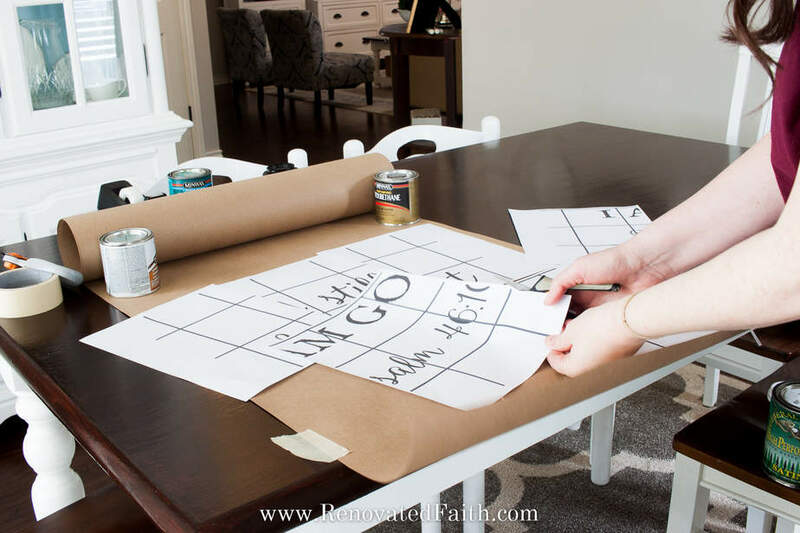 You can tape it to the kraft paper with painter’s tape so it stays in place. 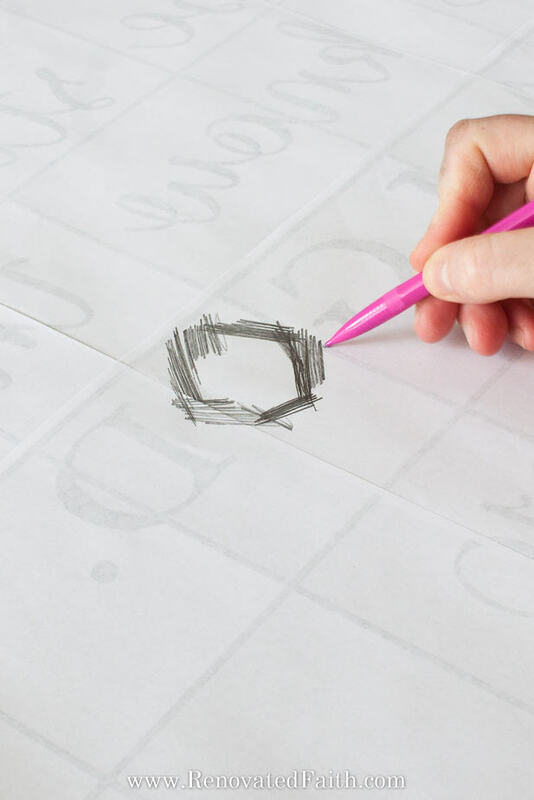 Now use a pen or pencil and just trace the outside of the letters while pressing down pretty hard. The pencil lead will transfer to the kraft paper. If the outline isn’t very dark, that’s fine. You just want it dark enough that you can see it to trace with the sharpie. 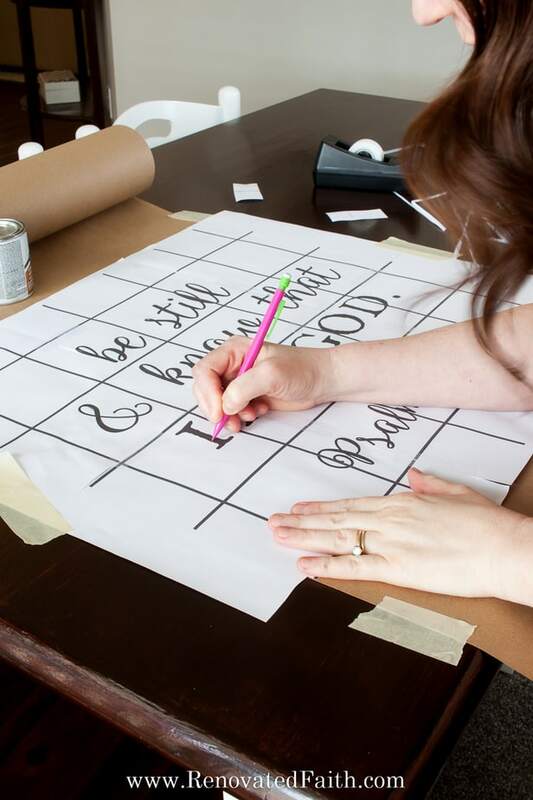 Pull up the template and now you can start to fill in the letters on the scroll sign with a black sharpie. I like to outline the outside edge and then go in and fill in the rest, one letter at a time. Now, curl up the ends and secure them with scotch tape at each end. To hand the paper scroll sign, I just ran the jute through the top roll and attached it with a flat thumb tack to the top of my blue window. Now stand back and admire your beautiful art work!!! DON’T FORGET TO TAKE A PICTURE OF YOUR PAPER SCROLL DECOR! Now that you are done, I’d love to see how it turned out! Post your photos here! Soon after hanging the sign, I walked through the entry way into our dining room with dozens of anxious thoughts swirling through my head all concerning my daughter’s dyslexia and the horrible school year we’ve had. 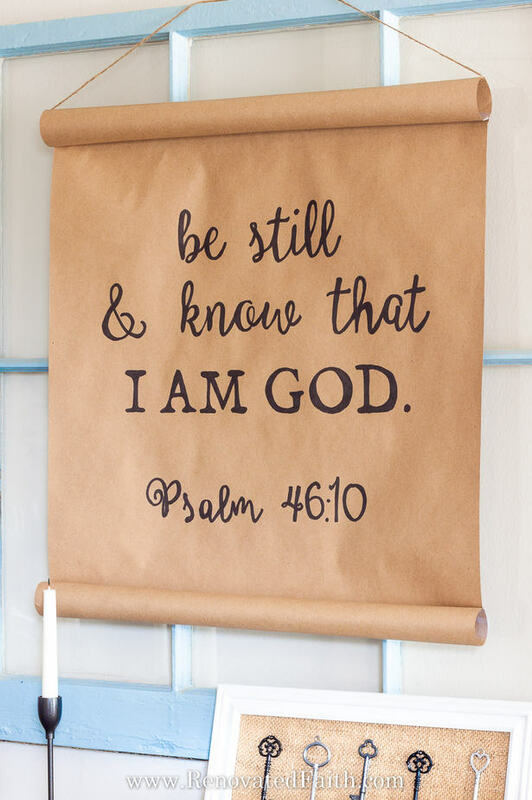 It was right then that my daughter noticed the sign for the first time and read aloud “Be Still and Know that I am God”. My intention was to sit in the dining room with the sun streaming through the windows to work on the outline for this very post. But her sweet voice reminded me that what I needed most was to bask in the message of the words on the sign itself. But in reality, that’s exactly the opposite of what I do. Like a woman in a straight jacket, I often try to escape my trials by my own strength, will and determination. All the while the only person that holds the key stands right there in front of me waiting for me to call out to Him. That’s not to say that God will always take away the trial. But, He PROMISES to be our refuge and strength, holding us tight in His arms until the storm passes and it’s safe to go outside again. What are you upset about? What is consuming your thoughts? What are you striving against? Make a long list so you can get it out of your mind and onto paper. Now, take a moment to pray about each item on the list. As you pray, trust God with each bullet point. Give it to Him, knowing that He is your fortress and a very present help in trouble. 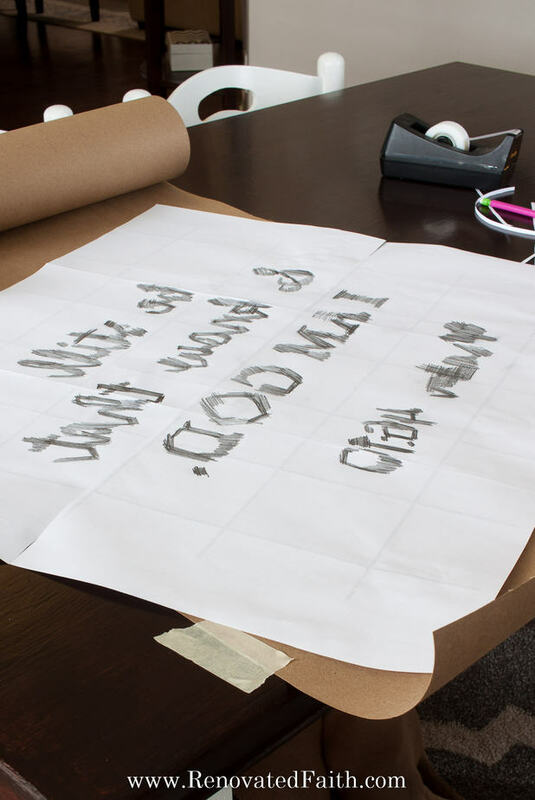 What if my DIY Paper Scroll Sign is Crinkly? We’ve had a lot of rain lately, and I wondered if the humidity would just make my craft paper sign crinkle up. The more I looked at farmhouse scrolls online , the more I realized they are all crinkly and it just contributes to that farmhouse look. That’s what I love about farmhouse decor. It definitely embraces imperfection and who couldn’t use more of that attitude in life?!? 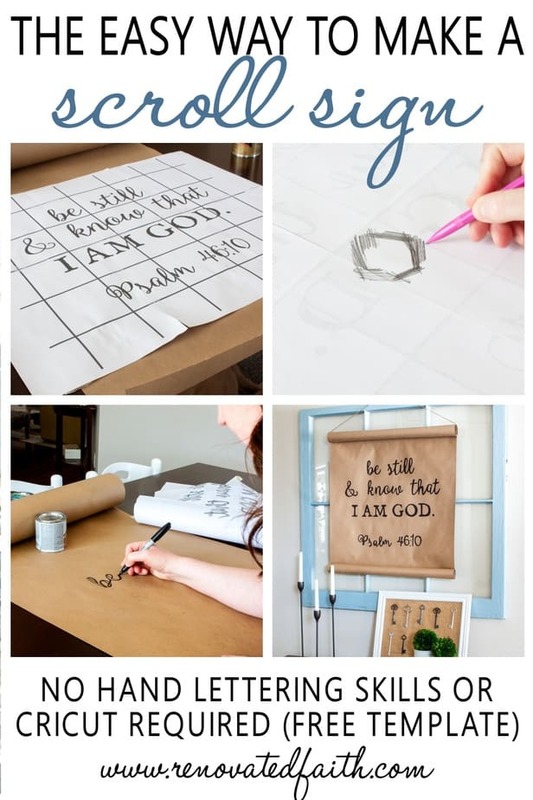 Can I Make My Scroll Wall Art with Butcher Paper? 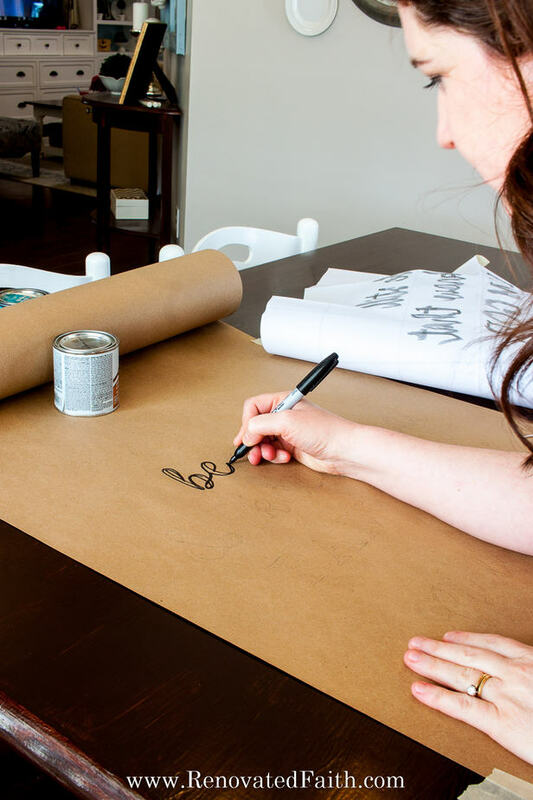 If you have butcher paper already on hand to make your scroll sign, then use that! 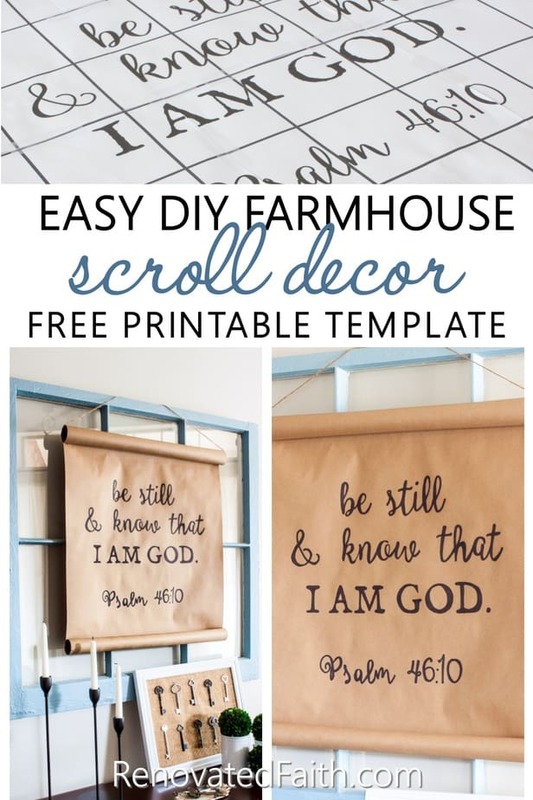 More commonly butcher paper has a red hue but if you find some that is brown, that would be a great option for your diy scroll wall art! 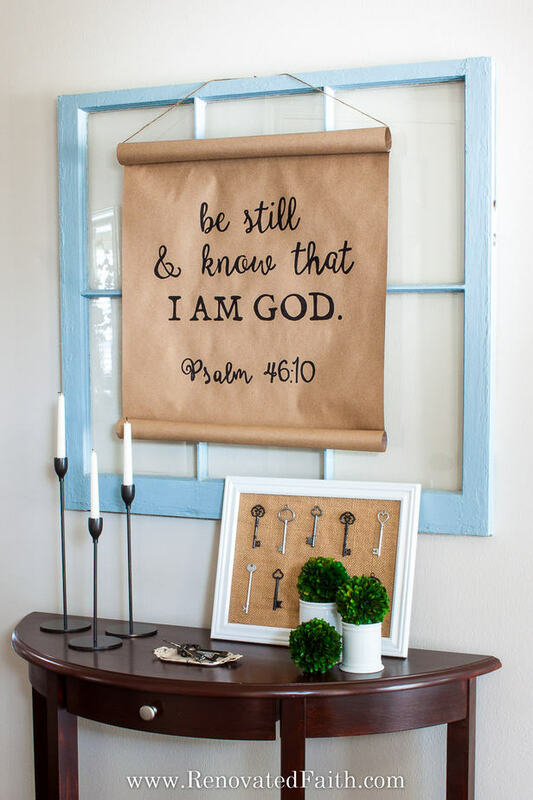 As you can see, this wall art is more than just a cute inexpensive project, but it’s a wonderful reminder of a verse that is near and dear to my heart. As life can be full of trials and hardship, it’s important to remember that there is one thing that never changes. No matter what you have to endure, God can be your mighty fortress in the storms of life if you trust in Him. 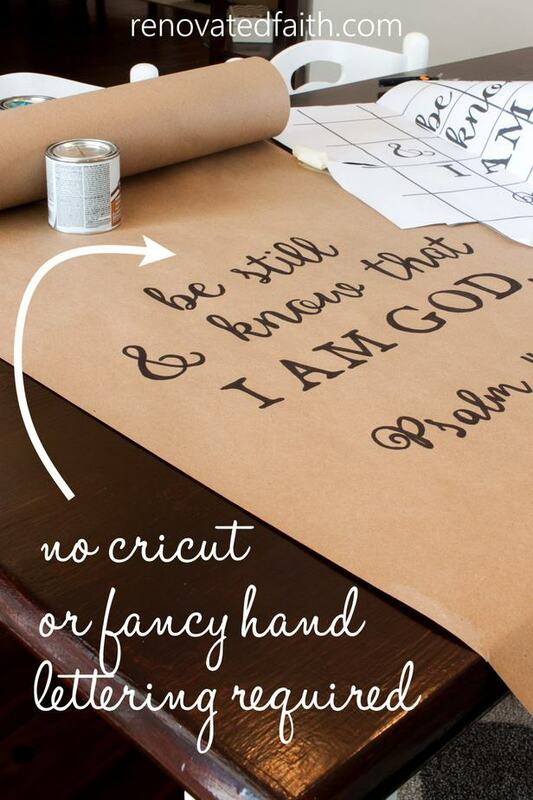 Now, go grab your kraft paper and start working on your own encouraging scroll wall art! Thank you for this post and all the others you create. 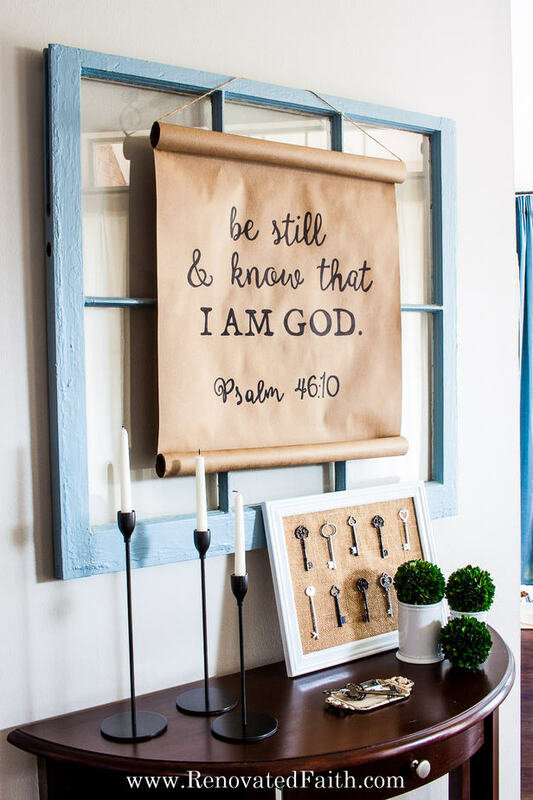 I love the Printables you make as I need (want) God’s word around me as a constant reminder in this world of strife. You do a beautiful job of sharing God’s word and I find it so encouraging. Thank you so much Nancy! I really appreciate that. I need God’s Word around me on a constant basis too! Have a great day!